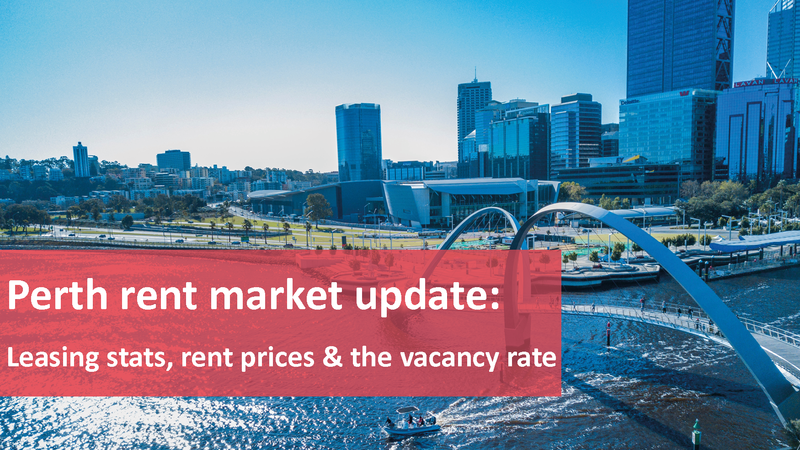 Reiwa has released the latest Perth rent market statistics and it’s positive news for both Perth overall, and the local south eastern suburbs! The statistics shed light on the total properties leased, for rent, as well as the weekly rent prices between 2017-2018. 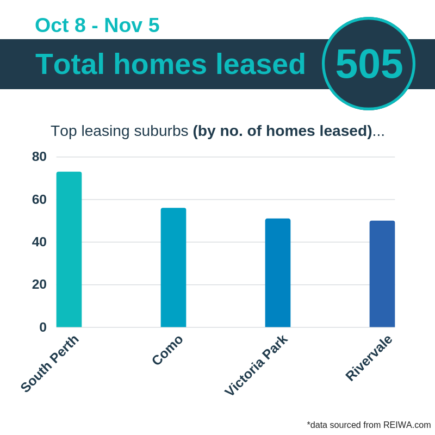 Of 505 total properties leased, 73 were in South Perth, 56 were in Como, 51 were Victoria Park, and 50 were in Rivervale. 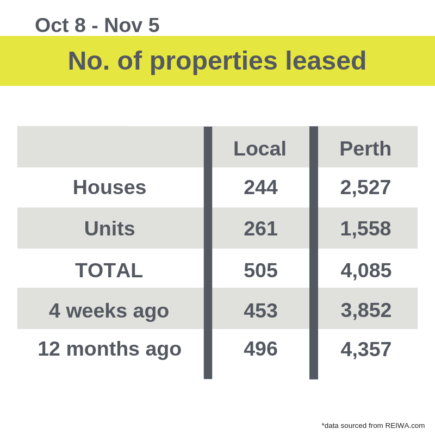 Total local listings for rent currently make up 12.6% of total Perth listings for rent, as compared with 12.7% four-weeks ago, and 12.9% twelve-months ago. This reflects a 0.3% fall annually. 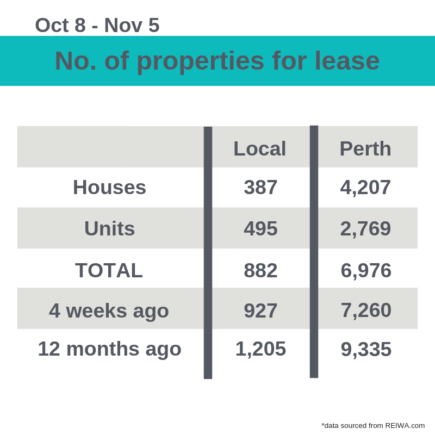 Total local properties leased currently make up 12.3% of total Perth properties leased, as compared with 11.7% four weeks ago, and 11.3% twelve months ago. This reflects a 1% annual growth. Perth market rent prices have remained stable over the past twelve months. 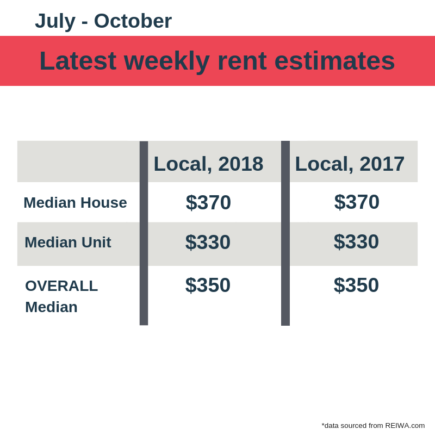 The median unit price is sitting steady at $350 per week, while the median house price recorded a 9.7% rise, from $350 per week in 2017, to $360 per week in 2018. The overall median price remained constant at $350 per week. The local market rent prices have likewise remained stable over the past twelve months. They are also outperforming the overall Perth rent market, with the median house price for south eastern suburbs sitting at $370 per week, and the median unit price at $330 per week. The overall median price remained constant, and on par with the Perth market, at $350 per week. What does this mean for landlords and the Perth rent market? The general consensus is that the worst is behind us! An unchanged weekly rent figure tells us that the market has stabilised, meaning that the median rent price may not increase during 2018/19, however, the discounted rent prices that have burdened landlords over the past few years should, finally, be over. Why is this great for sellers? According to REIWA, last month the vacancy rate fell to 3.9% and this is the lowest level Perth has experienced in four years! When the rate gets to 3% to 3.5%, rent prices start to increase, and tenants start moving from renting to buying. This is because it becomes cheaper for them to purchase their own property than it is to pay their rent. Thinking about renting your home or investment property? If you’re after information about the current market, some guidance through the property management process, or a rent appraisal on your property, we’d love to help! Give us a call on 08 6254 6300, or book your obligation free rent appraisal here!